I never realized how exhausting winter break can be. This is really the first year that L has been home on a break where she’s gotten cabin fever. She missed her friends at school and missed playing with them. Mommy and Daddy were exhausted with a new baby at home and couldn’t devote the time we wanted to playing Barbie and Shopkins. We tried really, really hard to get her out of the house. Last Tuesday, some friends from an old school she went to were meeting up at Skyzone for a play date. L loves Skyzone and it was an excuse to get out of the house, so we took her. After an hour or so of playing on the trampolines, our time was up. It was a little after 11:00 and we were all hungry. J suggested getting something for lunch, but didn’t have a preference. I wanted someplace kind of low key because B hadn’t eaten in a while and L was pretty amped up from running around. I chose to head back to Sprinkle Road and find Michelle’s Restaurant. J and I have eaten there in the past when it was Derks Restaurant, but EMA Enterprises branded this one over to a Michelle’s some time ago. The diner hasn’t really changed from what I can remember. 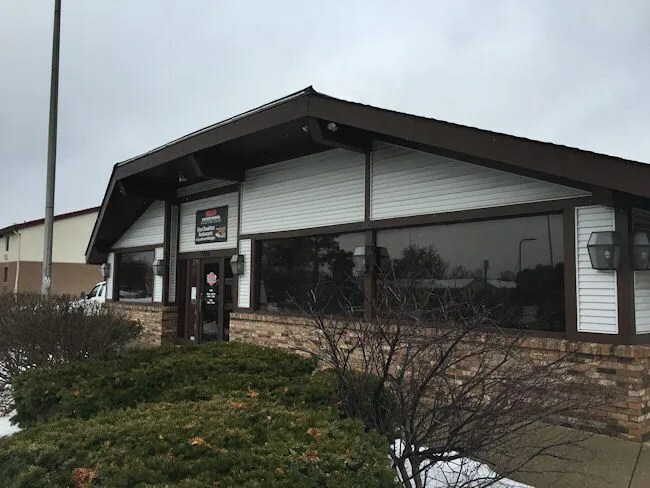 The EMA website calls it a “nostalgia” restaurant that has been in operation since 1954. I see it as more of a small town diner than the other bigger, faster paced restaurants in the EMA stable. This one is kind of frozen in time with dated decor and a small menu. It reminds me a lot of the restaurants from where I grew up in Central Illinois where the farmers gathered every morning to drink coffee and gossip before spending their days in the fields. As I figured, there weren’t many people in the restaurant in the odd time between breakfast and lunch. There was an older couple finishing up their breakfast and another older woman sipping coffee and reading in book. The waitress took us to a booth in the back of one side of the restaurant. You can still tell how it was partitioned in the prehistoric days when smoking was allowed in restaurants. The booth was awfully tight. There wasn’t enough room for me to slide B’s car seat in beside me, but he had started to wake up anyway, so we took him out so J could feed him. I slid into one side of the booth by myself while J and L (and eventually B) took the other. J and I both started with Coke’s and got water for L. It didn’t take us long to look over the menu because the menu wasn’t that big. It seemed smaller than the other Michelle’s restaurants to me, but we usually eat breakfast at EMA restaurants. Maybe I just haven’t paid attention to the lunch menus at the other places. I ordered a sandwich off the Michelle’s Favorites section of the menu called the Texas Burger. The 1/2 lb burger is topped with BBQ pulled pork and shredded cheddar cheese. It’s served on buttered Texas Toast and holy cow was that a delicious choice. The burger was buried under a huge mound of roasted pulled pork that was only lightly covered in BBQ sauce. The sandwich as a whole was on point, but the choice of bread did everything to make this sandwich really damn tasty. The sandwich comes with choice of chips or fries and applesauce. I chose the fries and let L eat my applesauce. 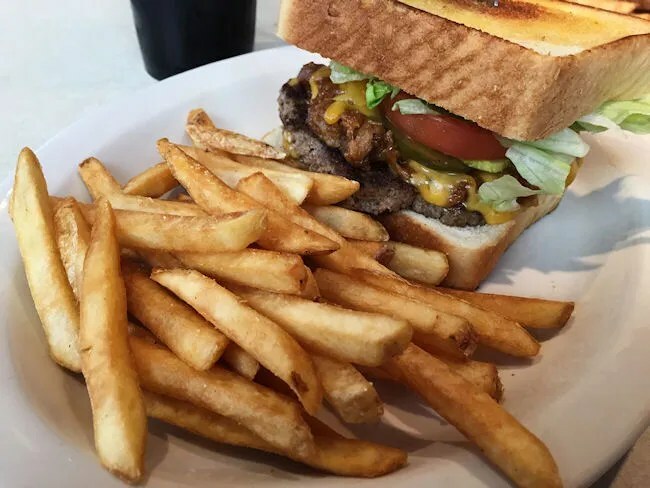 The fries were nothing special, but they were nice and crispy and went perfect with this sandwich. J went with the Grilled Cheese. This simple sandwich was made all that much better by the same buttered Texas toast that my burger came on. 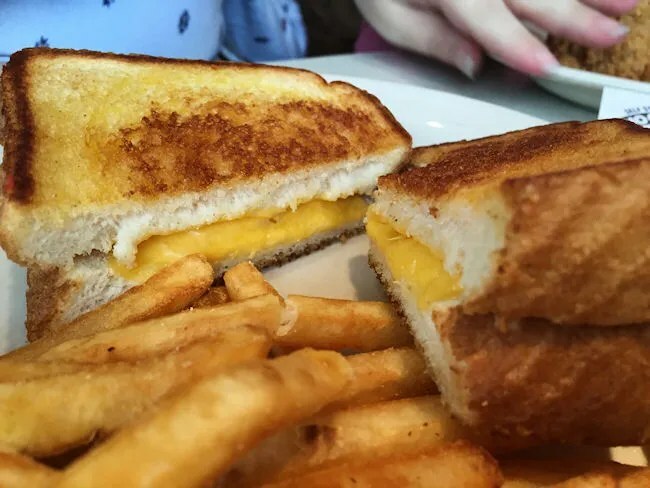 It’s one of those grilled cheese that isn’t going to win an award for being fancy, but you’re still glad you ate it. J also got fries and applesauce with her meal. She didn’t give her applesauce to L instead keeping it for herself and sharing some of her fries. We let L pick her meal and she ordered the chicken tenders. 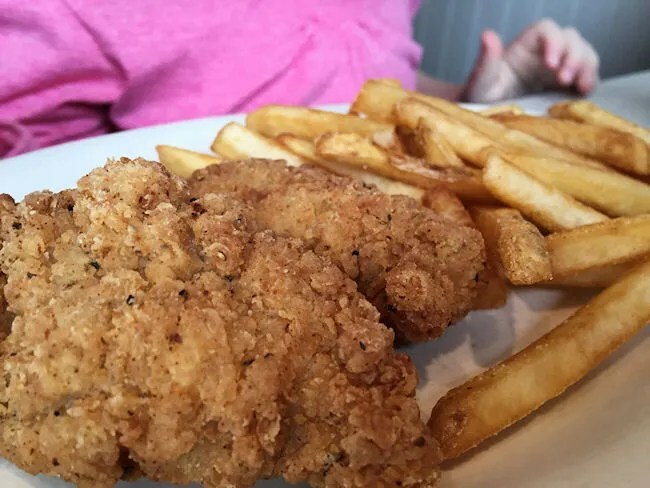 These tenders were plump and juicy pieces of white meat that had a crispy breading yet were still tender and juicy in the middle. L, being L, only ate one of the tenders and some fries…but she ate two whole bowls of applesauce, so I guess that’s something. J and I split the remaining tenders because they were pretty good. Our bill came out to just over $21. Michelle’s Restaurant isn’t the fanciest restaurant in the chain, but it’s not supposed to. It’s a restaurant that’s supposed to remind you of a simpler time and it doesn’t that effectively. We all enjoyed our lunch. 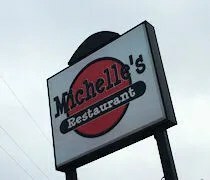 It wasn’t anything fancy, but it was simple, delicious food just like we’ve come to expect from the Michelle’s name.